To say we had a long winter here in New York is an understatement. But now spring is here and we’re able to open the windows and let the sunshine and fresh air in, and we’re in overdrive with our spring cleaning! 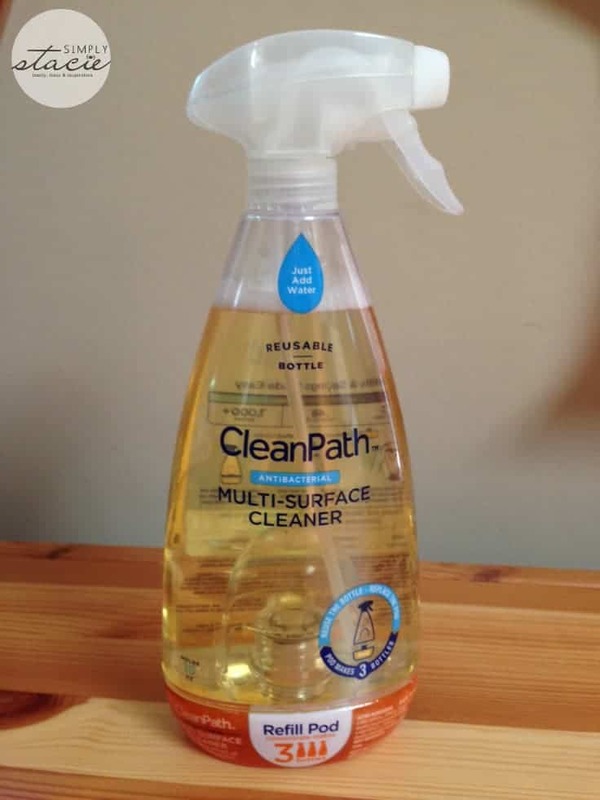 I always have an arsenal of cleaning products under my kitchen sink and I have some new and unique products from CleanPath that promise not only to clean well, but to cut down on your costs and plastic consumption. CleanPath sent me a gift card to use to pick up some of their cleaning products, available exclusively at Walmart stores. I was happy to find a Multi-Surface Cleaner and Glass Cleaner at my local store. I picked up a bottle of each, as well as a refill pod for each. 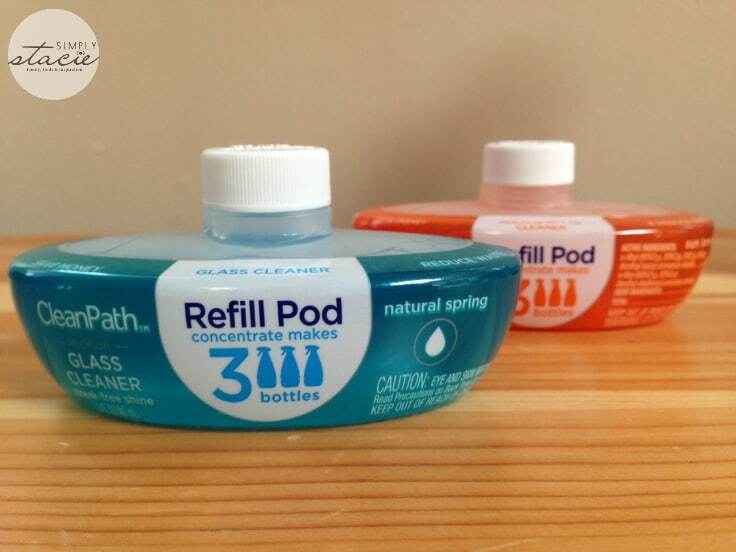 What makes CleanPath great is that you only have to pay for a bottle once – after that, you simply use the refill pods. In New York, each complete bottle was $3.58, with each refill pod only $2.28. The concept is pretty neat, in that you simply have flip the bottle you’re using in order to fill it with your cleaner (it has a built in measuring cup, so you can’t make a mistake! ), flip the bottle back over, add cold water, and you’re ready to go! Each pod contains enough cleaning liquid to fill up the bottle three times – so you’re getting a lot bang for your cleaning buck with CleanPath. What I love, is that I now only have to buy refill pods, so I’m using less plastic (and the bottles and pods are made of recyclable materials). Plus, these products work – we’ve been using the multi-surface cleaner everywhere (from our bathrooms to our kitchen), and the glass cleaner is helping us get off all the grime that has built up over the winter. I’m impressed with the cleaning power and the environmental impact. CleanPath was developed with the vision to reduce the waste in cleaning products. By having consumers add their own water at home, CleanPath is able to use 80% less plastic, energy, and carbon emissions than pre-mixed cleaners (which are 90% water!). 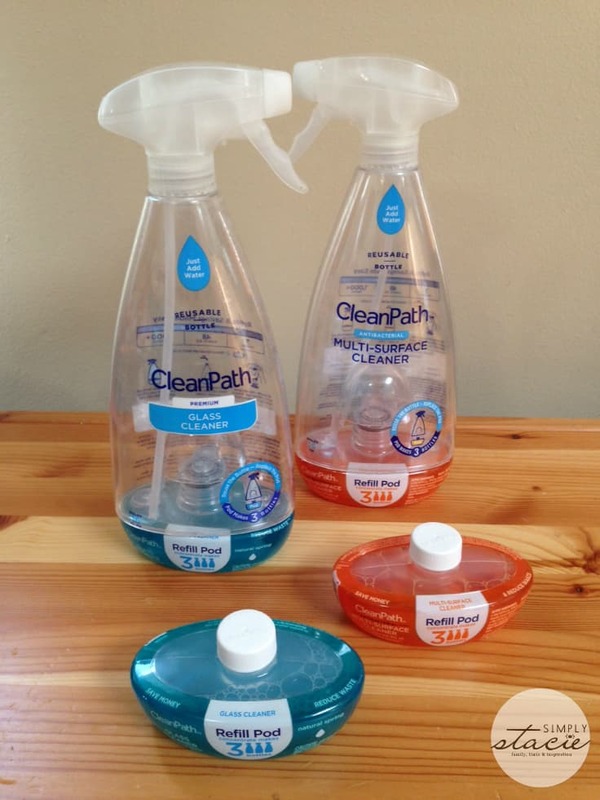 CleanPath offers a full line of cleaners and hand soap. You can see all they have to offer on their website. I like that the ad reminded moms to keep products like these away from the curious hands of little ones. I learned that it is an empty bottle that you attach refills to, and each refill pod is good for 3 bottles. I like the Foaming Hand Soap. I like that the bottle is reusable! I like that the ad was responsable. I’d like to try the Foaming Hand Soap. I like that it create less waste for the planet because of the repeated use of the reusable bottle and refill pods. I like that it is low cost. I was shocked to learn you can use it on wood and glass. I learned that you can find it only at Walmart. I like that it will greatly reduce the plastic that is thrown away each month. This is such a great idea. I hate paying for water. I love how CleanPath’s products are no mess/hassle free. But not only that, one pod also fills three bottles! I learned that their products are good for the environment. I have been struggling to find products that are not harmful to my pets and myself. So glad I found this, hope I win. I heart the Refill Pod concept. CleanPath Reusable Bottles are thicker, more durable and made to last for years, not months. With that said, you should treat your bottle with care and not drop it, since it is built for normal use. These are awesome! They save you money, waste, everything is user friendly. One pod gives you up to three whole bottles full. Reusable so it’s great for our earth. I like the aspect of being able to reuse the containers. I learned that by using the reusable bottle, you pay less than $1 per bottle when you buy refill pods. That means more clean for the buck and less waste for the planet. Love! Whether its filthy hands or a messy countertop, CleanPath is ready with DfE (Designed for the Environment) approved Hand Soaps to powerful Cleaners that eliminate germs. I like that there is 3 Bottles in every pod. I like the Bathroom Cleaner. I like that it is reusable and inexpensive. learned that each refill pod makes 3 bottles of cleaner. I learned there are 3 bottles in every pod! I learned that you pay less than $1 a bottle when you buy the refill pods, helping out in more ways than one. Thank You for the giveaway… CleanPath Antibacterial Bathroom Cleaner Eliminates 99.9% of household germs. What an amazing concept — it is so versatile and money saving. I also learned that it was only available at Walmart. I like that it’s a low cost cleaner and that each refill fills three bottles. I’m a green freak so I love that the bottle can be used over. I have never heard of this before. I learned there are all types of cleaners for all types of things.